This guest post was written by Imo Chinasa Ude, a ONE Champion based in Lagos, Nigeria. 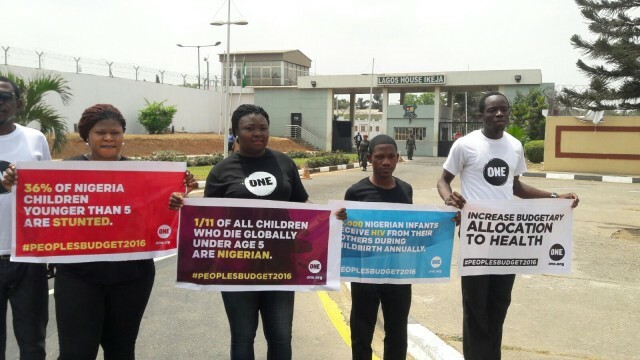 On Saturday 19th February, a group of ONE members known as the ONE Champions took to the streets of Ikeja, the seat of the government in Lagos state as part of ongoing efforts to advocate for an increase in the budget allocated to the health sector in Nigeria. We were – and still are – calling for the government to make the 2016 budget a pro-poor budget, which will reflect on the welfare and well-being of the nation’s citizens. This is because the current allocation to the health sector is a far cry from the 15% Nigeria agreed to meet at the 2001 Abuja Declaration. The ONE Champions were sending a direct message to government about the changes that the people want to see. Over the years, Nigeria’s health system has deteriorated to a point where the country does not have an emergency preparedness unit that is capable of handling disease outbreaks. The death rate this year following the LASSA fever outbreak is a case in point. Some alarming statistics have driven us to act. For example according to UNICEF, about 300,000 children between 1-5 years will die this year alone in Nigeria because of malnutrition. ONE Champions and members can’t turn their heads and allow such tragedies to continue especially now that the country’s budget is in the process of being passed into a working document. Thus, ONE members are saying to the Nigerian government: invest more in our health as a nation! We started our stunt at the City Mall where we spoke to many young people to mobilise them to support the #PeoplesBudget2016 campaign. It was exciting to meet people including national basketball players (whose heights really were intimidating) and music artists and sign them up as ONE members. After the mall we walked down to the State Government House and the Lagos State House of Assembly and stood with our banners and messages about the budget. We chose strategic positions for our stunt near the CCTV cameras mounted in every corner of the government house, in order to make an impact to get our message across loud and clear. About ten security personnel came to engage us, which we used as an opportunity to deliver our message and explain the purpose of our campaign. While members in Lagos were campaigning in the streets, other members across the states were building public pressure, circulating pictures on social media platforms, tagging, and tweeting at relevant government officials and institutions, politicians in order to engage policy makers. This activity was fun but also gave us hope. Getting positive responses from people who signed up to ONE on the day gave us the reassurance that everyone wants this positive change to the health budget, and that like us, they also want to see an end to extreme poverty. In fact, the hope we saw in their eyes when we told them about our efforts for the #PeoplesBudget2016 was priceless. To help make positive changes in Nigeria and to fight for an end to extreme poverty and preventable disease, JOIN ONE today!